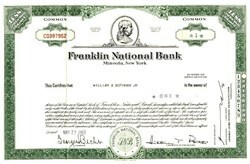 Beautifully engraved uncancelled certificate from the Franklin National Bank issued no later than 1964. This historic document was printed by the American Banknote Company and has an ornate border around it with a vignette of Franklin. This item has the printed signatures of the Company’s Chairman of the Board ( Arthur T. Roth ) and is over 43 years old. In October 1974, the U.S. banking system was shaken to its core by the collapse of Long Island's Franklin National Bank, the nation's 20th largest bank. Caused by mismanagement and fraud, it was at the time the largest bank failure in the history of the U.S.
Out of the debacle came disgrace and jail sentences for several bankers, a suicide in Italy, huge losses for the bank's stockholders -- but not its depositors -- and a black eye for the federal bank regulatory system. A couple of months after Franklin was declared insolvent on Oct. 8, 1974, and most of its assets taken over by European-American (now known as EAB). 1926 Franklin Square National Bank (“Franklin”) opens its Franklin Square branch with total capital and surplus of $62,500. 1935 Franklin offers first installment and FHA loans and cuts home mortgage applications from 30 to three days. 1939 Franklin is the first to hire high school students as part-time tellers. 1941 Franklin is first to open a walk-up outdoor banking facility, own a parking lot (Franklin Square), open a life insurance department, offer a medical insurance plan checkbook, and publish a bank annual report. 1947 Franklin Square National Bank drops "Square" from its name. Franklin is first to offer junior savings accounts and the first commercial bank to refer to a time deposit as a savings account. 1950 Franklin and South Shore Trust Co. merge. First National Bank of Inwood opens a drive-in-teller window. 1952 Franklin issues the first credit card and opens a municipal loan section. Franklin and Bank of Farmingdale merge. 1953 Franklin and First National Bank of Bellmore merge. 1954 Franklin and First National Bank of Inwood, Great Neck Trust, and Nassau County National Bank merge. Supreme Court favors Franklin’s use of the word “savings” for interest-bearing accounts in commercial banks. 1955 Franklin and First National Bank of Glen Cove, Nassau County Trust, Roslyn National Bank & Trust merge. 1956 Franklin Square branch opens a drive-up window. 1957 Franklin and State Bank of Suffolk merge. First issue of Franklin’s Almanac (Franklin’s employee magazine). 1958 Franklin and Central Islip National Bank merge. No-smoking policy on Franklin’s banking floors. 1960 Franklin and Federal Bank & Trust merge. 1961 Bronze statue of Benjamin Franklin is unveiled at Roosevelt Field. Franklin Square branch opens second drive-up window. 1964 Franklin offers its first CD for under $100,000 and opens its first Private Banking branch, 410 Madison Avenue. 1965 Franklin is first New York bank to inaugurate a savings bond program (CD). 1966 Franklin opens its first in-store branch in White’s discount department store in Middle Island and La Banque Continentale at 785 Fifth Avenue and Bank in a Park at Broadway and Howard Streets. 1967 Franklin and Federation Bank & Trust Company merge. 1972 A European financier acquires a majority of Franklin stock. 1973 Franklin’s Manhattan executive headquarters, 450 Park Avenue, opens. Franklin pilots Saturday hours at six branches. 1974 Franklin is placed in receivership; European-American Bank & Trust Company acquires selected Franklin assets and liabilities. Long Island banker Arthur T. Roth is credited with introducing the bank credit card and drive up teller window. Fondly known as "Mr. Long Island", Arthur Roth played a key role in the development of Long Island banking from 1926 through the 1970's. By challenging traditional banking practices and creating new services, Roth turned the floundering Franklin Square National Bank into the 18th largest bank in the nation. Above all, he placed his confidence in the consumer and his energy into consumer needs. Among his countless changes, Roth made loans and mortgages readily accessible and banks more user friendly. In the course of building the bank, Roth financed the homes and businesses that built Long Island. With the same spirit, Roth made innovations that have changed today's workplace. He pioneered smoking bans as early as the 1950's, encouraged the hiring of handicapped personnel, and worked diligently for community, educational and cultural causes, including service as a Trustee of Long Island University from 1954 to 1976. Despite his diligence and commitment, Roth was forced out of Franklin Square National Bank in the late '60's, and shortly thereafter, it collapsed, nearly causing a worldwide fiasco. The bank was taken over by European American Bank, which today carries out Roth's consumer-driven philosophy. Arthur Roth died in 1997, at the age of 91.